T-R PHOTO BY THORN COMPTON - West Marshall’s Josh Larsen (14) celebrates with Gladbrook-Reinbeck’s Tyson Creswell (33) after Creswell made a 3-point shot from halfcourt during the second half of the North Iowa Cedar League Senior All-Star Game in Reinbeck. Creswell finished the game with nine points and was the MVP of the West Division team. 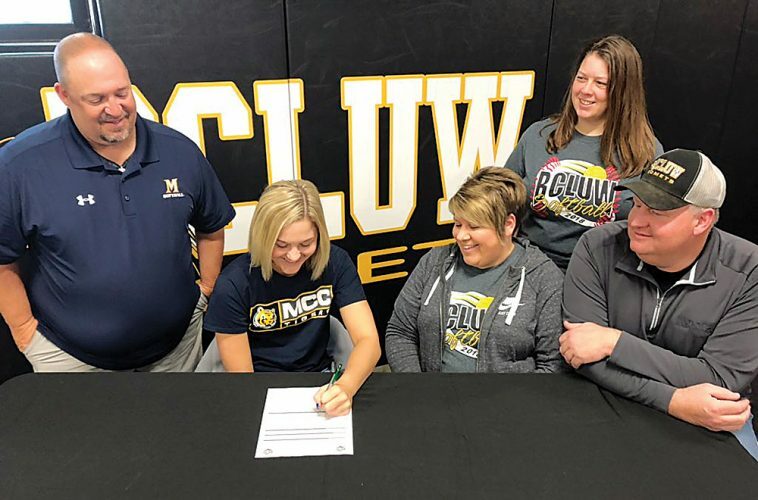 REINBECK — Last season the West Division swept the boys and girls games in the North Iowa Cedar League Senior All-Star Games, but this year the East got its revenge. 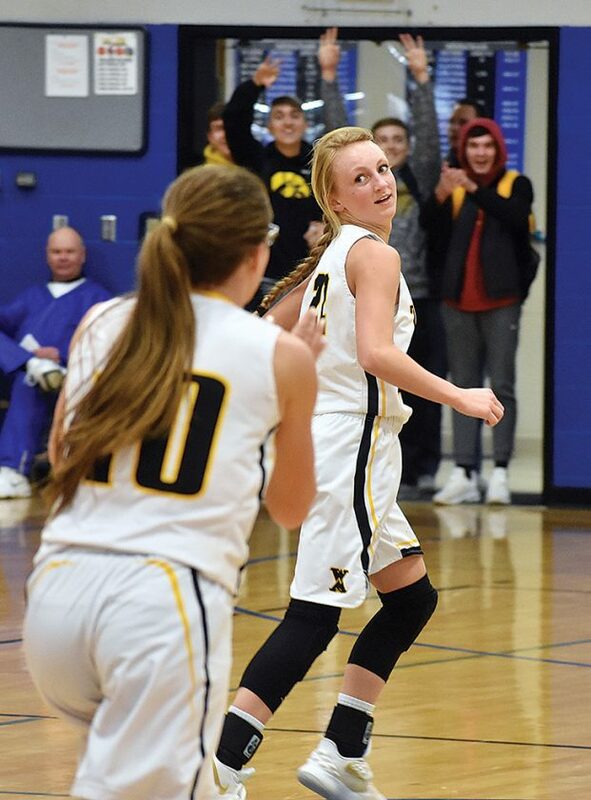 First in the girls game, which featured players from four different state tournament teams, the East came back from a halftime deficit to beat the West, 58-44. Then in the night cap the East boys avenged a one-point loss from a year ago with a 93-80 win over the West. Despite the outcome on the scoreboard, West Marshall senior Cameron Bannister said the experience was about much more than wins and losses. 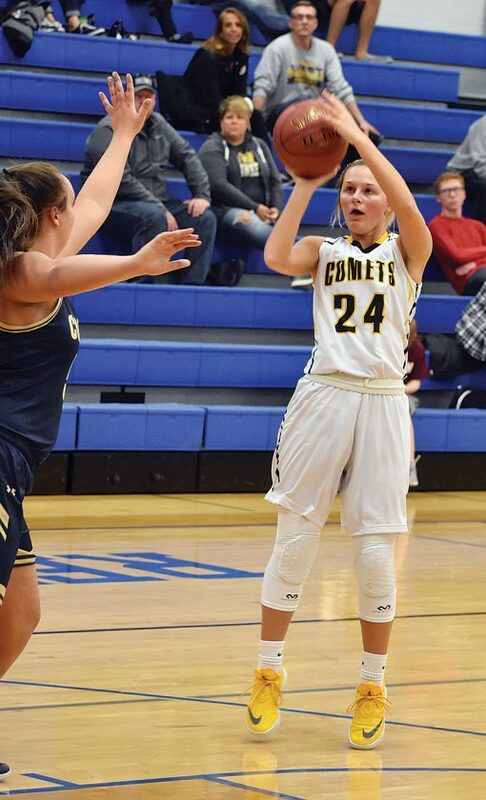 T-R PHOTO BY THORN COMPTON - BCLUW senior Bailey Ashton (24) rises up for a shot from just inside the 3-point line during the first half of the North Iowa Cedar League Senior All-Star Game in Reinbeck. Ashton finished with 11 points and was named the Most Valuable Player for the West Division team. Ivy Hirsch from Sumner-Fredericksburg was the leading scorer in the girls game with 17 points, and she and Emily Treptow from Jesup were named co-Most Valuable Players for the East girls. Bailey Ashton from BCLUW was the MVP for the West girls, as tied for the team lead in points with 11. 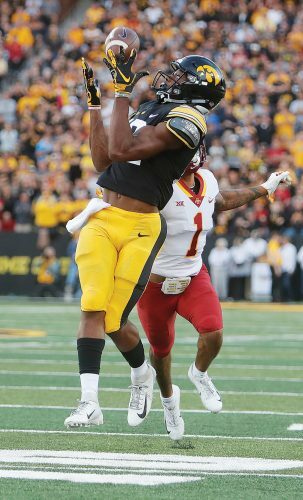 “It was fun to compete one more time since we all got another chance,” Ashton said. West Marshall’s Kayla Cripps and Gladbrook-Reinbeck’s Taylor Gienger both also matched Ashton with 11 points. 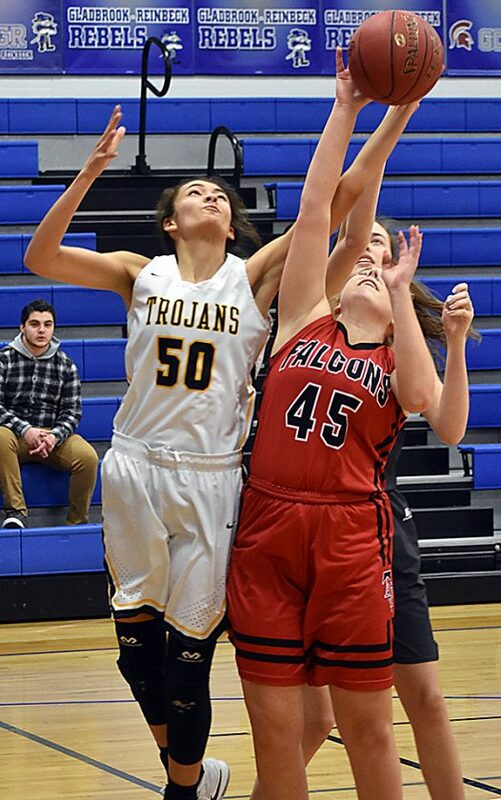 The West girls faced a large height differential with the East girls boasting quite a few post players, but West Marshall’s Grace Girard was a last-minute add that helped the West compete on the boards and in the paint. Ashton said the West girls did everything they could to compete against a team that had both an advantage in size and number of bodies. “We had to work harder than them for everything it seemed like but we hung in there,” she said. Girard finished with seven points, including the first 3-point make of her career, and she said it was a good time on the court. On the boys side, the West trailed 54-35 at halftime and faced a deficit of more than 20 points later in the second half, but a spark came from an unlikely source that helped the boys get back and compete. Gladbrook-Reinbeck’s Tyson Creswell, who had made one 3-pointer all year, uncorked a shot from halfcourt that banked off the backboard and into the net, then he made another shot from way downtown that helped spark a run that got the game back to single digits. 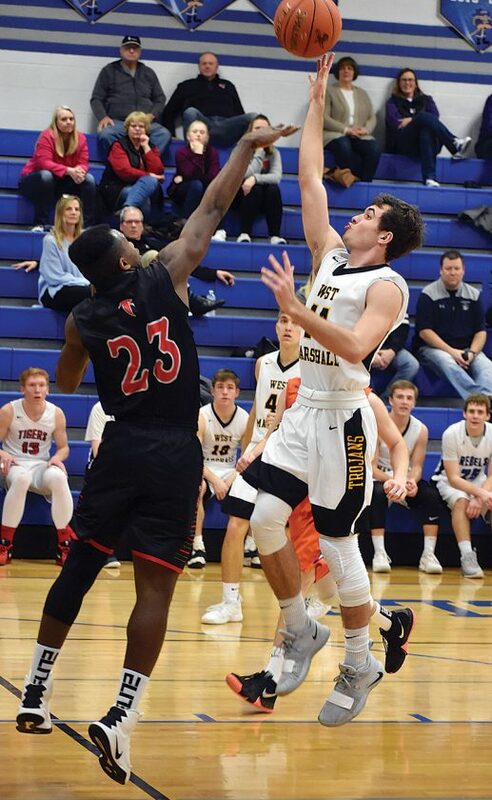 Creswell made three 3-pointers on the night, all of which totalled about 100 feet combined, and he was named the MVP for the West boys with his nine points. “It was awesome, they were all telling me to shoot it and I thought, ‘might as well let it fly! '” Creswell said. As for his shot from halfcourt, Creswell said there he didn’t even think about passing it away. “I knew I was going to shoot that as soon as I got the ball,” he said with a smile. 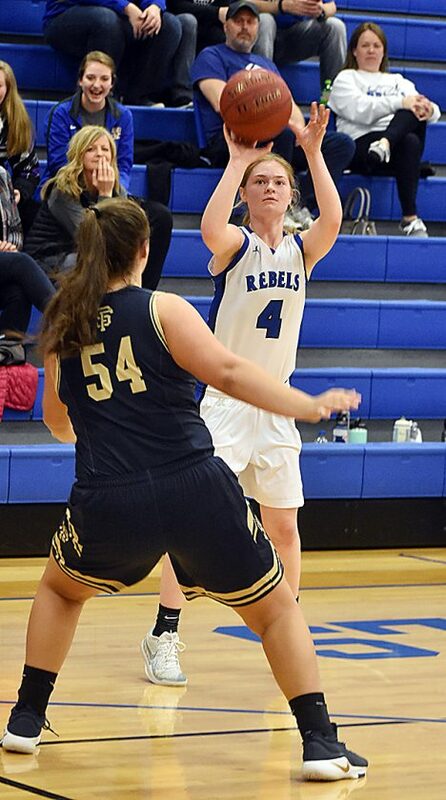 Bannister was the leading scorer for the West with 12 points, while Travis Kuester from Grundy Center followed with 11 and another Rebel, Jackson Kiburis, finished with eight. Junior Bodden from Aplington-Parkersburg had a game-high 22 points and was named the East MVP, while Jacob Murray from Hudson had 18 points and Tim Koop from Dike-New Hartford had 14, including a game-high four 3-pointers. Bannister said after competing against the other boys from the West for so long, it’s nice to play with them for a change. Girard said it was the same feeling on the girls side. As for finishing his senior season with an all-star game MVP and a trio of memorable shots in his home gym, Creswell said this isn’t a night he will forget for some time. “It’s a great way to end it,” he said. EAST (58) — Ivy Hirsch 5 6-6 17, Emily Treptow 2 2-2 6, Rylee Wessely 1 0-0 2, Avari Everts 4 0-0 9, Mikenna Joerger 4 2-6 10, Carlee Dove 1 0-0 2, McKenna Oldenburger 0 0-0 0, Jenna Pagel 2 2-4 6, Erin Riordan 3 0-0 6. TOTALS 22 12-18 58. WEST (44) — Taylor Gienger 4 1-2 11, Katie Thompson 1 0-0 2, Kayla Cripps 4 1-1 11, Bailey Ashton 5 1-1 11, Cora Saak 1 0-0 2, Grace Girard 3 0-0 7. TOTALS 18 3-5 44. 3-Point Goals–East 2 (Hirsch, Everts), West 5 (Gienger 2, Cripps 2, Girard). Total Fouls–East 2, West 13. Fouled Out–none. EAST (93) — Aaron Bartels 5 0-0 13, Ryan Darrah 0 0-2 0, Blaze Quigley 2 0-0 5, Tim Koop 5 0-0 14, Cade Nolan 1 0-0 3, Junior Bodden 10 2-2 22, Jarrett Kruse 4 0-0 10, Jacob Murray 8 0-0 18, Shane Duffy 4 0-0 8. TOTAL 39 2-4 93. WEST (80) — Seth Diser 2 0-0 4, Jake Tollefson 0 3-6 3, Jacob Vander Wilt 3 0-0 7, Josh Bartling 1 0-0 2, Kaleb Roling 0 0-0 0, Cameron Bannister 5 0-0 12, Travis Kuester 4 0-0 11, Josh Larsen 1 0-0 2, Alex Hames 2 0-0 6, Jackson Kiburis 4 0-0 8, Tyson Creswell 3 0-0 9, Alex Whitney 1 0-0 3, Joe Johnson 3 0-0 6, Alex Halter 3 0-0 7. TOTALS 29 3-7 80. Halftime–East 54-35. 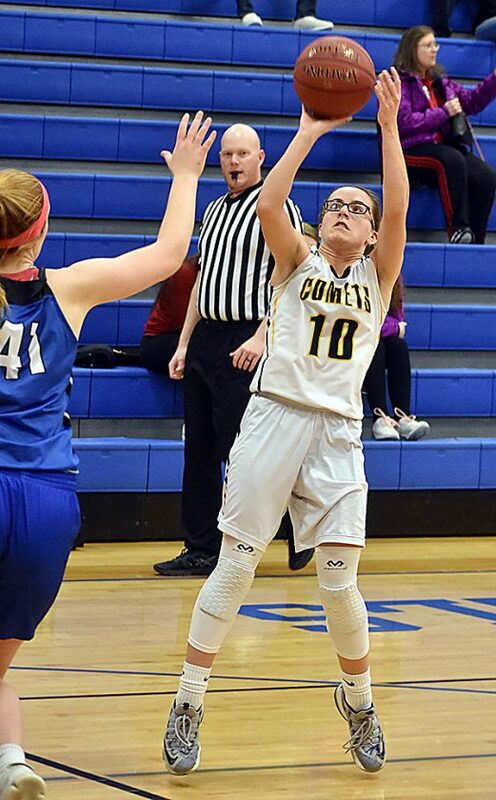 3-Point Goals–East 13 (Koop 4, Bartels 3, Kruse 2, Murray 2, Quigley, Nolan), West 16 (Kuester 3, Creswell 3, Bannister 2, Hames 2, Vander Wilt, Whitney, Halter). Total Fouls–East 4, West 7. Fouled Out–none. 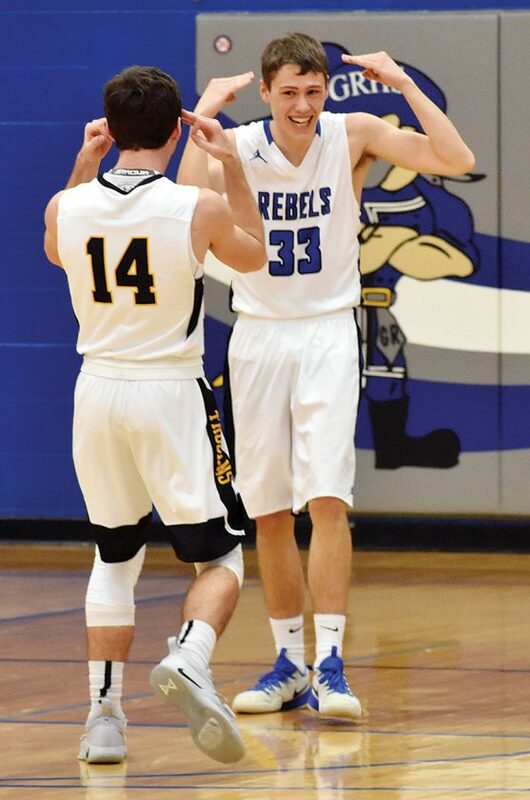 T-R PHOTO BY THORN COMPTON – West Marshall’s Josh Larsen (14) celebrates with Gladbrook-Reinbeck’s Tyson Creswell (33) after Creswell made a 3-point shot from halfcourt during the second half of the North Iowa Cedar League Senior All-Star Game in Reinbeck. Creswell finished the game with nine points and was the MVP of the West Division team.